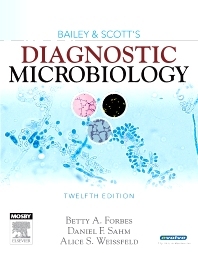 The new 12th edition of Bailey & Scott's Diagnostic Microbiology solidifies its reputation as the classic text in the field of microbiology. This new edition features the same comprehensive, authoritative content — and adds new and updated material throughout. The team of authors includes three well-respected clinical microbiologists, all of whom have experience both in the classroom and the clinical laboratory. A respected author team consists of three well-respected clinical microbiologists, each of whom has experience both in the classroom and the clinical laboratory. Genera and Species to be Considered highlight all of the organisms to be discussed in each chapter, including the current name of the species as well as any previous names. Detailed hands-on procedures make the content more interesting and relevant by describing exactly what takes place in the micro lab. A glossary of all of the terms is found at the back of the book for quick reference. 14. General Considerations and Applications of Information Provided in Bacterial Sections of Part III NEW! 15. Bacterial Identification Flow Charts and Schemes: A Guide to Part III NEW! Part VIII: Clinical Laboratory Management NEW! 65. Sentinel Laboratory Response to Bioterrorism NEW!